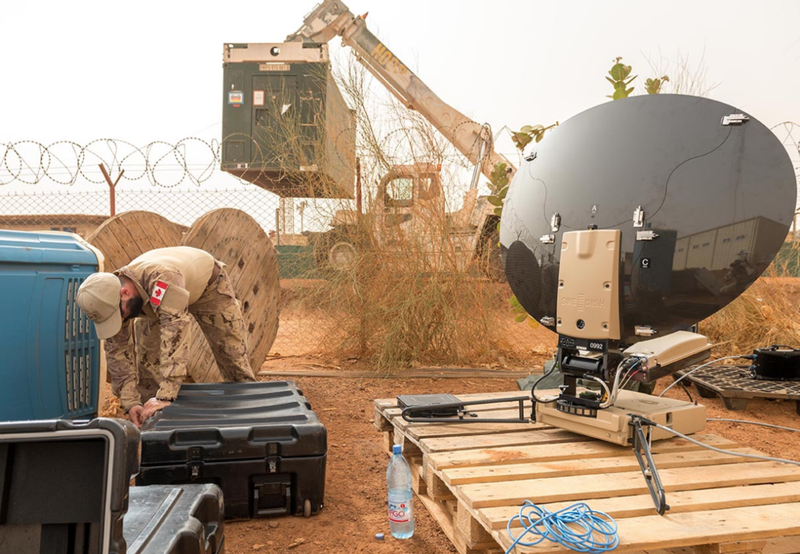 An Army Communications Information System Specialist with Operation PRESENCE - Mali sets up the Land Force Portable Satellite Terminal at Camp Castor in Gao, Mali on June 26, 2018. Photo: Canadian Forces Combat Camera. ©2018 DND/MDN Canada. Ottawa, Ontario — Long gone are the days of the carrier pigeon. Today’s Army Communication and Information Systems Specialists (ACISS) use cutting-edge technology to ensure functional wired and wireless communication for the Canadian Army (CA). Chief Warrant Officer Tracy-Ann Fisher, who serves with 31 Signal Regiment in Hamilton, Ontario, had ties to the Canadian Armed Forces (CAF) prior to joining the Army Reserve. Her grandfather served as a Despatch Rider during the Second World War and would talk about his exciting experiences delivering critical messages to military units by motorcycle over treacherous terrain. CWO Fisher had other family members who served in the Forces. When she was a child, her uncle would take her to Remembrance Day ceremonies followed by a trip to the Royal Canadian Legion where she could spend time with Veterans. While looking for a summer job at the age of 17, she noticed that the Army Reserve was hiring. The Communication Regiment had posted on her Toronto, Ontario high school’s job board and the rest, as she says, is history. While being recruited for the Army Reserve for ACISS, CWO Fisher was not entirely sure what the trade entailed. It was her grandfather who made the connection between her trade and his former position as a Despatch Rider. She would be the second generation in her family to work with communication and information systems for the CAF. While the technology has changed, the mission remains the same, she noted. Always in high demand, ACISS are experts in radio, satellite and microwave broadband technology, fibre and copper broadband technology, and voice and data delivery services. They spend much of their time outdoors and are likely to be posted to the Signal Squadrons in Petawawa, Ontario; Valcartier, Quebec; Edmonton, Alberta; or the Joint Signal Regiment in Kingston, Ontario. However, they may work for other units in Canada and abroad. Camaraderie and teamwork have always played important roles in the Army. For CWO Fisher, friendships are one of the highlights of her work. “The people I work with are one of the best aspects of my job. You can really tell that they have also made a commitment to get the job done because they truly enjoy the work they are doing,” she said. As the Regimental Sergeant-Major, the most senior Non-Commissioned Member of her unit, CWO Fisher has a clear understanding of how strong teamwork and leadership lead to effectiveness. She has also witnessed the emergence of eLearning, which she believes has been a positive change. “It has allowed the Army to expand and open up some opportunities,” she said. Life in the Army seems to be a family affair. CWO Fisher’s husband is also in the Army Reserve as an Infantry Soldier. The couple has two children: a fourteen-year-old daughter and an eleven-year-old son. CWO Fisher has participated in a number of domestic operations throughout her career. She aided the community of Brockville, Ontario during the 1997 ice storm and participated in Operation LENTUS in 2017 to help fight flooding in Montreal. Her hard work has not gone unnoticed. CWO Fisher received a Brigade Commander’s Coin in 2012, a Brigade Commander’s Commendation in 2013 and an Army Commander’s Coin in 2017. As for her civilian job, CWO Fisher works for the City of Hamilton as a Training and Development Specialist. She believes the Army Reserve has given her skills that are transferable to the civilian world. “Leadership, instructional experience, working with others, teamwork, professionalism – these are all aspects of the Army, and civilian employers appreciate these qualities,” she said.